The Progress MS-04 cargo spacecraft before its ill-fated Dec. 1 flight. Photo Credit: RKK Energia. The recent failure of the Progress MS-04 mission is a reminder of how important the development of a new cargo spacecraft for the future of Russia’s space program is. The accident could hasten the works on a vehicle that could replace the current upgraded Progress spaceship. Just a few days before the Dec. 1 failure, RKK Energia, the Russian manufacturer of spacecraft and rockets, announced that the new cargo craft due to replace Progress MS could be ready for first flights to the International Space Station (ISS) after 2020. 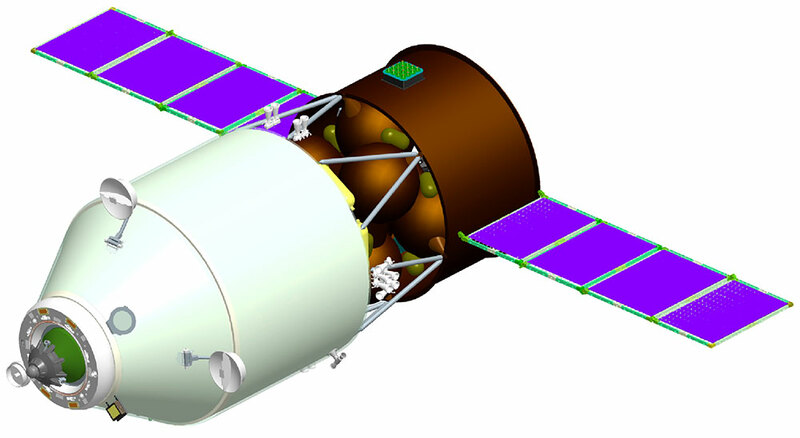 Artist’s rendering of Russia’s new ICCTS cargo spacecraft. Image Credit: RKK Energia. “The first flight of the enhanced payload cargo spacecraft is possible after 2020,” the company stated in a press release. The new vehicle is currently known as the Increased Capacity Cargo Transportation Spacecraft (ICCTS). With a liftoff mass of approximately 8.2 metric tons, it will be capable of delivering up to 3.4 metric tons to the ISS – nearly one metric ton more than Progress MS. Russia hopes that the new vehicle will reduce the cost of delivering one kilogram of cargo by 15 percent. ”With the new spacecraft developed, we will be able to send up more cargo per one launch. This will significantly improve the cost effectiveness of launches of logistic spacecraft to both the ISS and to the station, which is going to replace it. For us this is very important,” said Vladimir Solntsev, Director General of RKK Energia. RKK Energia revealed that ICCTS’s design would allow it to pack the cargo into a larger compartment with a central aisle and standard racks, which will significantly simplify the spacecraft loading and unloading operations. The new vehicle could potentially be utilized as a “warehouse” when attached to the space station. However, the new cargo vessel will not be able to reenter Earth’s atmosphere, as such, there are no plans to develop a version of the vehicle capable of returning cargo back to Earth. The manufacturer also noted that the ICCTS cargo craft will be more useful in the station’s orbital reboost maneuvers and could support a future de-orbiting of the ISS. These operations could be carried out by the new spacecraft due to its increased supply of deliverable propellant as well as higher thrust capability of its main engine when compared to the Progress MS. The spacecraft’s preliminary design is currently scheduled to be completed in December of 2016. Future launches of the new cargo craft are planned to be conducted from the Baikonur Cosmodrome in Kazakhstan, mainly by a Soyuz 2.1b rocket, using the existing infrastructure designed for Progress MS and Soyuz MS launches. It’s the rocket that failed not the spacecraft. We don’t know that. The official report is scheduled for December 20. Indeed, the report that just came out says it was most likely a failure of the third-stage engine.